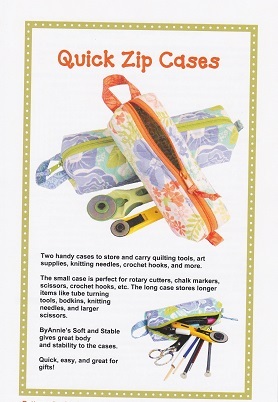 Quick and easy to make, these handy little zippered cases are perfect to store and carry quilting supplies, art supplies, knitting needles, crochet hooks and lots more. The small case is perfect for rotary cutters, chalk markers, scissors, and more. The long case is sized to carry longer items such as tube turning tools and bodkins.